Dr. 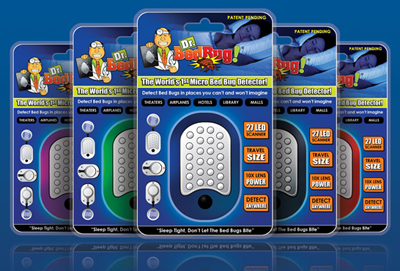 Bed Bug is the world's first travel size Micro Bed Bug Detector. Dr. Bed Bug was originally conceived for the international traveler who has to deal with a virtual Who's Who of hotels and lodging where bed bug infestation undermines their 5 star rating. This ingenious lightweight detector is the first thing to grab before you go anywhere – theaters, airports, malls – and sleepovers! No place is immune. Copyright © 2011 Dr. Bed BUG, Inc.